Following is a list of news items and announcements of upcoming events, reminders and the like. Information posted on this website is not medical advice and should not be taken as medical advice, should not be used to diagnose or treat a health problem or disease, and is in no way meant to be a substitute for professional medical care. Please schedule an appointment or consult your own physician if you suspect a health condition or serious medical problem. Acetaminophen products (Tylenol) can be given every 4 hours. However, if you are needing to give regular doses, you should contact your pediatrician. A fever is the body’s normal response to infections and plays a role in fighting them. It is important to take your child’s temperature if you think they may have a fever. Call the office immediately if any child under 2 months of age has a temperature equal to or greater than 100.4 °F. The usual fevers (100°F to 104°F) that all children get are not harmful. Most are caused by viral illnesses; some are cause by bacterial illnesses. Most fevers with viral illnesses range between 101°F and 104°F and last for 2 to 3 days. In general, the height of the fever does not relate to the seriousness of the illness. How sick your child acts is what counts. Fever causes no permanent harm until it reaches over 107°F. Treat all fevers with extra fluids and less clothing. Popsicles and iced drinks are helpful. Acetaminophen (Tylenol) can be used every 4 hours as needed or if your child is uncomfortable. Remember that the fever is helping your child fight the infection. Ibuprofen (Motrin) can also be used and lasts for 6 hours. It is not recommended to routinely alternate the two medications, as this increases the chance of improper dosing. If the fever still does not respond, a bath with tepid water can be tried. Aspirin should not be used for children. See medication dosing sheet for Tylenol and Motrin dosing. A cold is a viral infection of the nose and throat and is spread by hand contact, coughing, and sneezing, not by cold air or drafts. Since there are as many as 100 – 200 viruses that cause the common cold, most healthy children will get at least six colds a year. Usually the fever lasts about 3 days. (See fever handout for management of this symptom.) Nose and throat symptoms may last 1 week, and the cough may last 2 – 3 weeks. The main things to watch for are secondary bacterial infections such as ear infections, yellow drainage from the eyes, sinus pressure or pain in older children, or difficulty breathing. Not much can be done to affect how long a cold lasts. However, we can try to relieve some of the symptoms. Infants: 2 – 3 warm saline drops in each nostril, wait 1 minute, suction with bulb syringe only if you see mucus coming out of the nose – perform this no more than 2 – 3 times a day. Suctioning can be helpful prior to feeding, if the congestion is making it difficult for your child to eat and breathe at the same time. – Place pillows under the mattress of the crib as to elevate the head of the bed to help with easier breathing. – Place a cool mist vaporizer in the room during naps and bedtime. Toddlers: Over one year of age – try a teaspoonful of honey prior to bedtime. Over two years of age – OTC medications can be tried, but have not been proven to help. Ensure adequate fluid intake, extra rest, and good hand washing. Diarrhea and vomiting are usually caused by a viral infection. The main complication is dehydration from excessive loss of fluids. It is your child’s dehydration that you need to worry about and not the presence of diarrhea or vomiting. The main goal is to prevent dehydration by giving enough fluids orally to keep up with the fluids lost. Dietary changes remain the best way to treat diarrhea and vomiting. Breast-fed infants: Continue breastfeeding, but more often and smaller amounts. Your goal is to avoid filing the stomach. After 8 hours without vomiting, return to regular breastfeeding. Bottle-fed infants: If you child is vomiting, give clear liquids such as Pedialyte in small amounts for 4 – 8 hours. 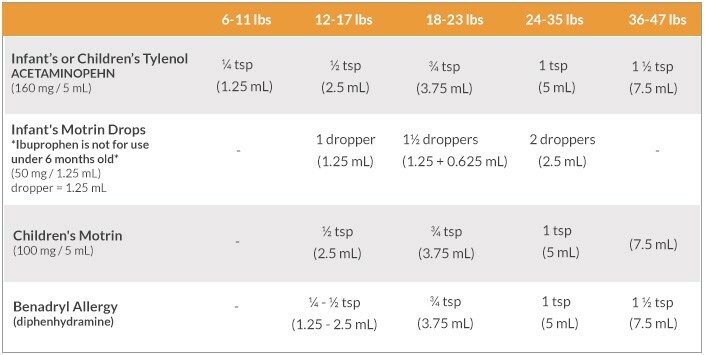 In worse cases, you often have to give a little as 1 tsp every 5 minutes for 4 hours, then 2 oz every 10-15 minutes for 4 hours. After 4 – 8 hours without vomiting, return to formula. If the diarrhea continues, change to a lactose free formula and keep your baby on it until the diarrhea is gone for 3 days. For infants over 4 months old, also return to cereal, oatmeal, and baby food, especially the starchy ones (carrots, bananas). Avoid fruit juices, peaches, pears, prunes, and apricots. Children over 1 year: Offer clear fluids in small amounts for 8 hours and then progress to starchy food such as cereal, oatmeal, bread, pasta, mashed potatoes, carrots, bananas, etc. Pretzels or saltine crackers will replace your child’s sodium needs. Sometimes you need to avoid milk for 2 – 3 days since lactose is not as easily absorbed. Active culture yogurt will help to replace the “good” bacteria in the intestines that were lost through diarrhea. Probiotics can also help the intestines heal. Avoid all fruit juice and other drinks containing sugar. Call our office if: Your child has less than 4 – 6 wet diapers per day or no urine for 8 hours; blood appears in vomit or diarrhea; vomiting continues more than 48 hours or diarrhea more than 2 weeks. 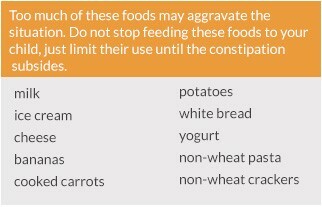 Constipation is the inability to pass stool or the painful passage of stool after straining and pushing for more than 10 minutes. Babies less than 6 months of age commonly grunt, push, strain, draw up the legs, and become flushed in the face during passage of stool. These behaviors are normal. 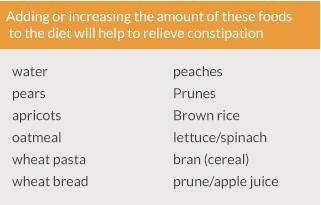 Constipation is often due to a diet with the wrong types of foods and resolves with proper diet (see tables below). Call our office if you notice abdominal distension or any other symptoms such as vomiting. * Note for newborns: Babies normally slow down in the frequency of stool at about 2 months of age. If stools are hard, give about 1 oz of prune juice mixed in bottle for 3 days. Eczema, also called atopic dermatitis, is know as the “itch that rashes.” Atopic dermatitis is a long-lasting (chronic) skin condition that causes intense itching and then a rash. It usually develops in early childhood and continues into the teen years. Adults also may have it or have milder symptoms than they did as children, along with sensitive-skin problems. If you have atopic dermatitis, your skin is very sensitive to irritants and is prone to becoming itchy and developing a rash. Scratching may seem to relieve the itch, but it often results in a rash and leads to a self-perpetuating cycle of itching, scratching, and rash. Good skin care is an essential part of controlling the itch and rash cycle of atopic dermatitis. To help prevent a cycle of scratching, itching, and rash, keep your skin hydrated and identify and avoid skin irritants. Soak in clean, warm-not hot-water for 3 to 5 minutes. Your skin will absorb water and still retain its natural oils. Losing the natural oils makes the skin drier. You may shower when atopic dermatitis is under control or when an outbreak is mild. Avoid washing with soap during every bath. When soap is needed, use a gentle, nondrying product, such as Aveeno, Dove, Basis, or Neutrogena. Use soap regularly only on the underarms, groin, and feet, and rinse immediately afterward. Don’t let children affected by atopic dermatitis sit in soapy water. Avoid adding bath oils and bubble bath to the bathwater, because they can reduce your skin’s ability to absorb water. Avoid using scrub brushes or washcloths. Pat your skin dry after a bath or shower. While your skin is still moist or even wet, apply a moisturizer immediately – within 3 minutes of leaving the bath or shower. Waiting longer allows the skin to dry out. Moisturizers include Aquaphor, Eucerin, or Purpose. For severe dryness, try petroleum jelly, mineral oil, or an all-vegetable shortening such as Crisco. Also apply the moisturizer several times a day. An oil-free lotion, such as Cetaphil or Aquanil. Cream-based or gel-based medications and cream moisturizer. Many soaps, lotions, and perfumes. The AAPCC member poison centers maintain a 24-hour Poison Help hotline. It is continuously staffed by pharmacists, physicians, nurses and poison information providers who are toxicology specialists. The Poison Help hotline provides immediate access to poison exposure management instructions and information on potential poisons. More than 70% of poison exposure cases can be managed over the phone. The Poison Help hotline serves as a key medical information resource and helps reduce costly emergency room visits.